In the list of upcoming IPO Dr Lalchandani Labs Limited is planning to launch IPO (Initial Public Offering). It is a SME IPO. The size of the upcoming IPO i.e Dr Lalchandani Labs IPO is of Rs 4.20 cr. It is Fixed Price issue. 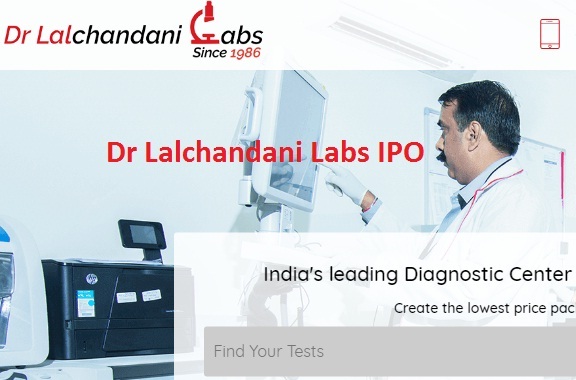 Dr Lalchandani Labs IPO will open on 25 April, 2018. Dr Lalchandani Labs IPO will open on 25 April,2018 and close on 27 April,2018. Issue type is Fixed Price. Issue size is Rs 4.20 crore. Issue Price is Rs 30 per equity shares. Dr Lalchandani Labs Limited is a provider of diagnostic and related healthcare tests. Later the Partnership Firm was taken over by M/s Dr Lalchandani Labs Limited incorporated under the provisions of Companies Act, 2013 vide certificate of Incorporation dated 2nd August, 2017 issued by the Registrar of Companies, Delhi vide agreement dated 31st August, 2017. Company offers patients and healthcare providers a broad range of diagnostic and related healthcare tests and services for use in core testing, patient diagnosis and the prevention, monitoring and treatment of disease and other health conditions. The Company is NABL Accredited Lab and has established 5 (Five) Self-Sufficient Labs and multiple collection centers within Delhi/NCR. All routine and specialized Biochemistry, Hormone assays, Drug assays, cancer markers, Torch Tests, Elisa T.B., Pap Smear and Histopathology studies. Ability to process 1000 samples/hour with same day reporting. Reputed suppliers such as Johnson & Johnson, Roche, Nicholas Piramal etc. Maintain robust documentation, control checks and Quality logs as per NABL. Employs full time staff of pathologists, trained technicians and quality manager with experience ranging from 5-25 years. 5 Self-sufficient Labs and 15 collection centers across Delhi/NCR. Empannelled for all major panels such as CGHS, DJB, MCD, DDA etc. Regulary participate in External Quality Assurance Service (EQAS) along with presitigious institues like AIIMS, Vellore & Sir Ganga Ram Hospital. They want to open major processing center with area of 2000 sq.ft in Delhi/NCR. Pre-payment/Repayment of certain borrowings, which are availed by the company. Company wants to purchase more advanced machinery and equipments. On COCO Model Company wants to open more collection centers. To develop E Applications/Programs and other I.T support system. For Recruitment, Training, and Placement of staff to expand operations and other operational expenses. Good customer follows up in dormant Stages – reminders for periodic health checkups. Management is young and enterprising and open to explore all business opportunities with open mind.